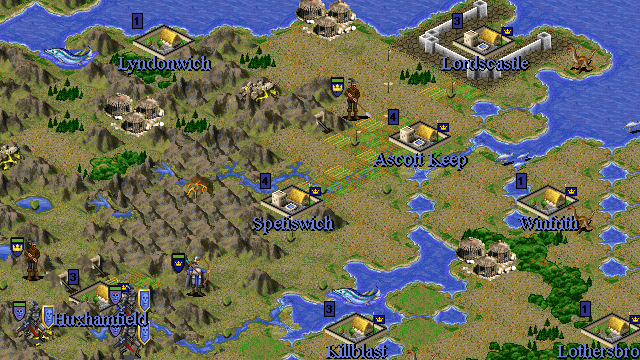 A scenario for Civilization II: Multiplayer Gold Edition by curtsibling. "In the years of cold, the empire was witness to a large island erupting through the waves of the northern sea. The magelords were convinced this island was the one spoken of in old tomes, sunk during a meteor strike many ages past. Now the promise of rich minerals and meteoric iron has prompted the Imperion to send representatives from his vassal provinces. Each has the grand task of creating a strong colony in the name of the empire... No matter the hardships." "But they are not the only pioneers on the arisen island... And what of the races who lived there originally?" "It's time to find out... Let's get on the boat and set sail for Bitterfrost!" 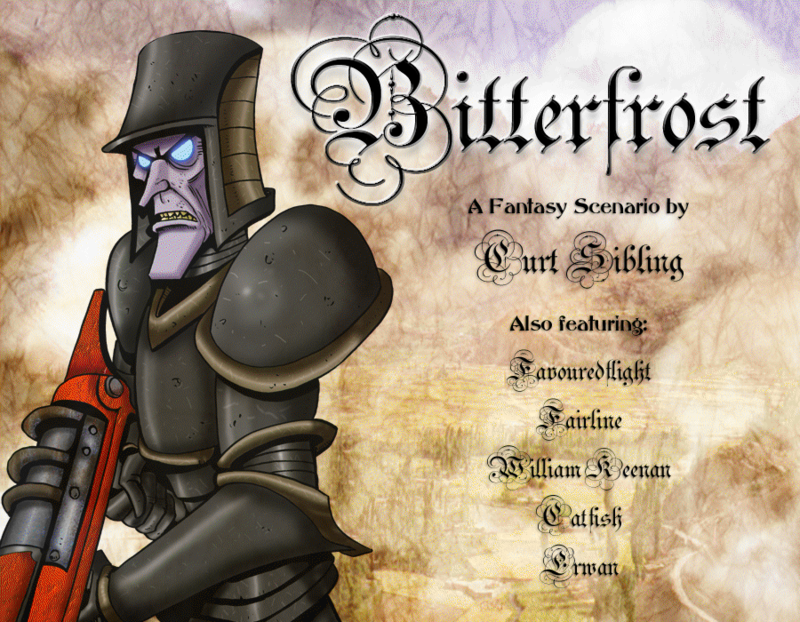 Bitterfrost is an empire building fantasy scenario, taking place on a harsh island populated by maniac natives and worse. Your mission is to pick one of the powers and build a colony into a kingdom, and then an empire. Finally being the total ruler of Bitterfrost. Righteous, grim, and some might say prudish, the Crusaders are warriors and seek to unite Bitterfrost with faith, or failing that, steel! They have little time for magic-users, and may even go on a crusade without warning! Their emphasis is on battle and grabbing as much meteoric Iron as possible! Perfect for build and conquer-style players. They want your money, but they might give you some of theirs, if you have something they want. Gold is what their greedy eyes are on! Bursars are heavily into commerce and have many innovations. They could probably buy Bitterfrost. They have some good warriors and a trade advantage. Some call them pagans, or heathen magic users, but they call themselves the Coven. They are users of magic and are (shockingly) ruled by women! But these people from cold climes are no mere mages, they also excel at the arts of war. This has led to the formation of spell-slinging warriors like the Guardians. The Coven begins with a good knowledge of magic, but will have to learn the runic language of Bitterfrost. In the dire east, there has ruled for an age the Undead kingdoms. From this awful place, a fell Lich and his army has arrived in Bitterfrost and built a keep. From this inauspicious place, the skeleton legions seek to smash the mortal kingdoms and rule the land with immortal hate. Prepare for war! 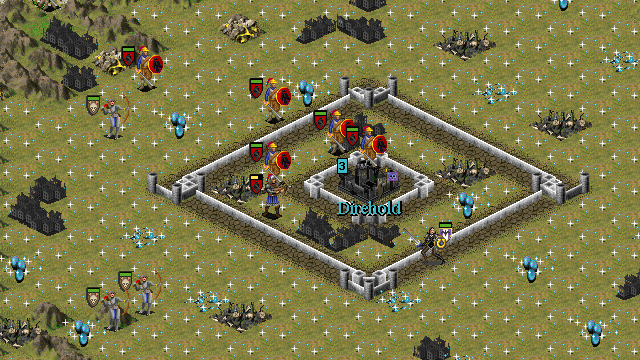 The undead have many frightening monsters at their command, and begin with an evil legion of skeletons. Also they will send out ghosts to spy and cause mayhem... For those who enjoy playing the baddies, look no further. An old legend exists about a realm, whose ruling witches accidentally transformed themselves into half-human maniac mutants. These were the harpies... Their breed has devolved through history, and are now crazed she-barbarians, with mating rituals best not spoken about. Since there are no harpy males, they kidnap compatible menfolk to breed with. A colony of them has appeared recently off the coast of bitterfrost. They may be seeking to infest the island. Although having very little interest in material technology, harpies understand pragmatism. Thus, they might hire humans to help them trade or spy. The tribal Zatarn are somewhat like the Amazons of our own world, except the Zatarn are horned and grey skinned. No to mention, more brutal, fanatical and numerous. For a long time they lived on small island communities like their enemies, the Urzit. Since the island's appearance, they have flocked there to build a tribal empire. The Zatarn males exist for breeding and are docile, the females fight and hunt. This quaint, low-tech, but role-reversed society is one of extremes. The tribes are ruled by evil shamanesses who conduct blood-soaked warfare to appease their arcane gods... Really! Expanding quickly and butchering the Urzit seem to be the Zatarn's two main goals... Currently. Amusingly, in their rush for colonisation, the humans, undead and other races have not paused to wonder why an island the size of continental Europe has suddenly risen after aeons on the sea bed... Raises many questions in your head, eh? A riddle indeed, but even the wise must ask this of themselves: Why did the place sink anyway? Why did it resurface? What secrets lie inland? And why have the Urzit colonised it so quickly? And who are the purple skinned monsters that are stammered about by half-mad beggars in the colony dockyards? Well, I am not going to tell you! (unless you hand over a gold groat - Thankee sir!) All I will say is this... There are rumours that the ancient race that ruled Bitterfrost has something to do with the island's reappearance. Not much is known of these heathens, apart from their odd skin colour and the fact that they reputedly ate their own children for fun, among other bohemian atrocities. The cosmos hurled a meteor unto their empire and sunk it from the sight of the gods... Luckily, since they had armaments a soldier would soil his armour in fear of! But there is much you will discover for yourself! Best not to fear monsters from the past, but greedy beggars that are here and now! The other kingdoms will keep you on your toes, and you must give as good as you get! The boat has almost arrived, get ready to wage war, trade, build and freeze with fear... Bitterfrost is on the horizon!